Sleep Medicine is a medical specialty devoted to the diagnosis and therapy of sleep disturbances and disorders. Sleep medicine is practiced by physicians and others who possess a post-doctoral degree. Our sleep specialist, Dr. Keith Cavanaugh, is board certified in Pediatrics and Sleep Medicine. Dr. Cavanaugh is not only committed to diagnosing the presence or absence of a sleep disorder, but also to evaluating patients overall respiratory health. Other Sleep-Related Disorders: sleep-walking, sleep-talking, bed-wetting, frequent nightmares, nocturnal convulsions, and night terrors. Most sleep disorders can be treated effectively once the condition has been fully and accurately diagnosed. In order to make an accurate diagnosis it is usually necessary for both the physical and emotional aspects of the problem to be examined. Some conditions require treatment with medications, while other may require carefully planned change in hours that sleep is scheduled. Please contact the sleep clinic for an appointment at (651) 220-6258. 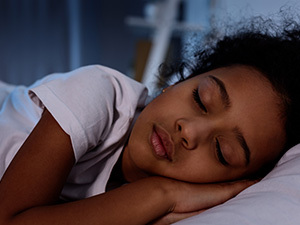 Our doctors’ care for children with sleep-related problems hospitalized at Children’s Hospitals and Clinics of Minnesota – Minneapolis and St. Paul, as well as Gillette Children’s Specialty Healthcare. We serve as the primary attending physician or offer consultative services at the request of the primary physician.